Over the past three decades, philanthropy has been catalytic in funding scalable innovations that demonstrate all students can achieve academically. But we have also learned that the supply of these innovations cannot reach their full potential without “actionable demand” that removes the political and policy barriers preventing innovations from being embraced broadly by school systems. We deliberately use the term “actionable demand” because there is widespread “latent demand” for great schools in all communities, regardless of socioeconomic makeup. All communities care equally about the education and future of their children. But caring is not the same as power. Most families in underserved communities do not have the economic power to move to better school systems, nor do they realize they have political power to influence change in the local school systems failing them. So to be direct, creating “actionable demand” is about power: Influencing or appropriating power and using it effectively to drive enduring change and equity in education systems. Specifically, parent power (“parent” being shorthand for any family member or guardian who cares for children). Truly transforming education systems requires parents who are (1) informed and (2) organized so that they can (3) exercise their power. Empowered parents, with the support of nonprofit allies, can then deploy a broad set of strategies to set the agenda for education change, achieve that change, and then sustain that change for their children, their schools, and ultimately their school systems. The good news is that there is a growing sector of social entrepreneurs who offer a diverse range of models for how to be allies to empowered local communities. We will walk through the need to inform and organize parents, name four strategies for how parents can exercise power, and then turn to the challenges we need to address as a sector to support this work becoming locally rooted in every community. People don’t try to solve problems they don’t know they have. In too many school districts and cities, parents are not even aware of the inadequacy of their education systems. A recent report by Learning Heroes reveals that 90 percent of parents nationally believe their children are at grade level in reading, when in reality only 34 percent of eighth-graders actually are. And this disparity holds true across all demographics. Many students and families in failing systems don’t find out that the system has failed them until it is too late. The life lesson of Maribel Gonzalez is a case in point. “I grew up in South Central LA – in Watts, where there are a lot of good people but not a lot of opportunity,” she explains. “My teachers told my parents I was ‘well behaved and a pleasure to have in the classroom.’ I was the valedictorian of my graduating middle school and high school classes. I had the highest GPA of my graduating class. Gonzalez ultimately overcame her lack of preparation and has become a leader in education activism (we’ll come back to her later). Sadly, Gonzalez’s story is not an anomaly. If knowledge is power, too many parents are disempowered by not knowing the truth about their schools and the academic readiness of their children. Too often schools are telling parents that their children are doing fine, even when they are not. And formal school reporting — at the school, district, and state levels — is too often untimely edu-gibberish. In order to truly know if students are getting an effective education, and to start on the journey to change things if they aren’t, parents need to be provided with clear, timely, actionable information about the performance of their children, schools, and school systems. Unfortunately, even well-intentioned education reformers sometimes fall into the edu-gibberish swamp. We try to tell parents everything they can know (and also everything we know), without focusing on the bottom line of what they want and need to know. We get too academic about academics, and end up not making a compelling, accessible, and relevant case to parents about the reality of the broken education systems they entrust their children to. Last, the messenger is as important as the message. People are more willing to listen to hard truths from people they trust — members of the community or those who have earned credibility in the community. Not long ago, someone admonished us, “If you tell parents how bad their schools are, but they can’t do anything about it, you’re only making it worse for them.” This is why effective education organizers don’t just help parents understand if there is a problem with education in their community; they also help them realize that they have the power to change what isn’t working. This is the true essence of organizing: It is not about giving power, but rather about helping people see the power they have but are not exercising. Each person’s approach to power may be different. Most parents will focus on exercising their power to meet the needs of their individual children. A subset will work as a group to take on larger education challenges in their school or across the system that they cannot solve without collective action. And a few will assume the mantle of community leadership, organizing an enduring, local movement that makes change happen and continues to preserve and protect it. Joe Givens, a lifelong community organizer in New Orleans, teaches that “organizing is about weaving a tapestry of trusted relationships.” Trusted relationships become the currency that purchases change. Every school system operates under different political and policy conditions and relates differently with the community of students and parents it serves. Some school systems have the “will” to be partners with parents and are looking for support to develop the “skills” to do it. At the other extreme are school systems where the relationship between parents and the system is adversarial, and parents are disenfranchised. We believe there are four major strategies for parents to exercise power. Given the variation across school systems, the mix and sequence of these strategies will of course be customized to local context. The ground floor for parents as agents of change is exercising their power as co-educators of their children. Some schools actively seek to build this type of partnership with parents, and nonprofit organizations like Flamboyan Foundation are able to forge collaboration between parents and educators. Organizations like Flamboyan and 1647 in Massachusetts help willing schools create this partnership. In other communities where schools do not seek out parents as partners, nonprofits work to inform and organize parents to understand the power they can exercise independently outside of school to help educate their children, and equip them with the knowledge and tools to do it. Some may say that parents empowered as educators isn’t really “power that drives systems change” because it is improving the education of individual children and not taking on any fundamental structural issues within the system. However, in response to that we would share two points. First, research shows that parents’ being effectively engaged in the education of their children is associated with a positive impact on learning. A 2015 Johns Hopkins evaluation of Flamboyan found that their work to create parent/school partnerships was more likely to result in lower truancy and better reading outcomes. Second, a journey of empowerment has to start somewhere. For many parents, realizing they have the power to contribute to the education of their children is in itself a mighty thing. And for some, exercising their power for their individual children helps them realize that this is only the start of what they can do. It also helps them identify if there are larger structural challenges in their school or school system, and that they have the power to address these. There is a dizzying array of choices parents must make about education, starting with choosing between schools and leading to an endless set of choices within a school. An emerging leader in supporting parents with these choices is EdNavigator, based in New Orleans. EdNavigator works with parents to help them assess for themselves the needs of their children, navigate the school selection process based on that assessment, and make ongoing education choices. Sometimes parents must use their voice not just to make a choice but to make a change. Empowered parents can vote with their voice to drive change for their own children, which again is important. But acting individually, parents can only get the most out of the existing system. Changing the system requires organizing collective voice. There are always competing interests in any political system, and collective voice allows parents to be competitive. Organized parents like Gonzalez-Martinez are finding that these are fights they have the power to win. 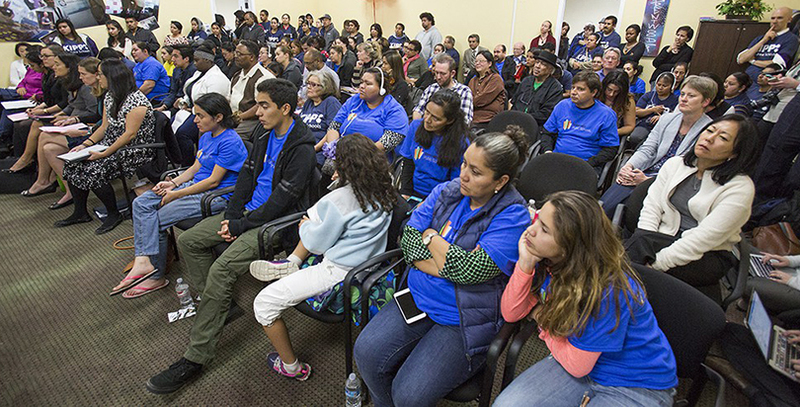 Parents in some Innovate communities have successfully set their sights on winning school board votes to allow charters to open in their districts. In other communities, parents are organizing to change special education policy. Their latent demand has become actionable. And keep in mind that the parents are leading and organizing for the agendas they themselves have created. Further, parents who realize they can exercise power to effect change keep fighting. They stay active to protect their gains and advance them. In some communities, parents have organized to vote with their voice and influence votes by current public officials. In other communities, parents are finding that the only avenue to changing their school and school system is influencing votes for public officials through electoral activism. In Oakland, GO Public Schools established both a 501(c)3 for community organizing and a 501(c)4 to be involved in electoral work. “We realized that expanding equity and opportunity in education in our community required not only parents raising their voice with school leaders, but also parents using their power to elect leaders who would take responsibility for student outcomes, drive progress, and recognize their accountability to the community,” says CEO Jonathan Klein. GO parents interview school board candidates and recommend who GO should endorse and support during an election. GO-endorsed candidates have won eight of the 10 Oakland school board elections since 2012, fundamentally reshaping the school board’s political will to drive change in areas ranging from district policies around funding, effective teaching, teacher raises, and the transformation of underperforming schools, to the approval of high-quality charter applications. Remember Maribel Gonzalez, from South Central Los Angeles? She worked hard to catch up and successfully graduated from UCLA. She then became a teacher, went to law school, eventually became an education organizer and is now California managing director of Students for Education Reform. SFER organizes college students, many of whom are the first in their family to go to college, in how to be organizers and lifelong education activists. In California, SFER organizers have been critical in engaging door-to-door to inform and organize local communities to exercise their power with their vote. They are helping to turn disenfranchised, low-propensity voters out to the polls to determine their school board representatives. One caveat to this strategy: Voting with your vote is not just about changing who is elected to public office. It also can manifest as communities exercising their power to support the political will of sitting public officials, who sometimes have an ardent desire to make a difficult change but need political cover and community support to act on it. None of these parent empowerment strategies need to exist in isolation. If you talk to Innovate Public Schools or GO Public Schools, they would say that while the ultimate expression of power in their work is parents voting with their collective voice and/or their vote, supporting parents to be partners in educating their children and making good choices is integral to making this happen. These initial strategies provide the most immediate places for many parents to learn how to exercise their power. They also enable parents to understand what larger systemic issues need to be addressed in their communities. And by meeting the needs of parents at this level, allies can build strong, long-term, trusting relationships with the community to then take on larger systemic changes. Integrating this full range of strategies is not required in all local contexts, nor is it easy to integrate them under one organization, but this is exactly what Stand for Children has pioneered since its founding in 1996. Stand, working across 11 states, educates parents on the issues facing their children. Stand builds their sense of agency as individuals, develops parent leaders (via programs like Stand University for Parents), and helps them organize to engage on policies and electoral campaigns affecting the education of their children. Additionally, new organizations are beginning to take root in other communities, adopting the lessons from existing organizations and pioneering new lessons for us all to learn from. There is amazing work being done by parents and their nonprofit allies to transform education. We just need many, many more of them. Why is creating actionable demand easier said than done? Who owns the agenda for education change in a local community? It is not uncommon to hear the refrain: “We need to empower parents on education to achieve ‘X’!” (X being the agenda that the speaker has set). If we truly believe that systems change will only happen when parents exercise their power, then we need to be comfortable that they will exercise this power in service of the agenda they create. This does not mean that as education reformers we have to abdicate having an agenda. It is completely legitimate for us to also have an agenda grounded in our beliefs about what a great school system looks like. But if we are sincere about parents being powerful agents of change in their communities, then we can’t just assume our agenda is their agenda. Jose Arenas teaches organizers that “organizing often means starting by listening to people in need and putting aside your own agenda in order to really be able to hear what their agenda is.” Once we’ve listened, and shown we’re credible allies, then we can share our point of view and begin a dialogue to forge a common agenda for change with a community. Funding fortitude. Funding and supporting this work is not a matter of a marathon versus a sprint. Rather, it is a commitment to walking 10,000 steps, every day, with no finish line. That is not the time frame within which most nonprofits and nonprofit funding cycles work. However, building a locally led infrastructure of empowered parents takes time and then has to be sustained. This requires that we have the fortitude to do this work and the fortitude to fund this work in order to achieve and sustain the systems-level change we aspire to create. Investing in community organizers and local parent leaders like we do in teachers and school leaders. We have no hesitancy in supporting programming to attract, train, develop, and retain great teachers and school leaders. The same mindset should apply to community organizers and local parent leaders. This means building and supporting a pipeline of professional community organizing talent, just as we do with educators, from their entry into the profession through their development into leaders of organizing organizations. It means also investing in the development of parent leaders, some of whom may eventually become full-time professional organizers. Building a pipeline of leaders of color in parent empowerment. While we need every good soul we can get to create the education change we envision, the simple reality is that we will not achieve this without significantly expanding diversity in education leadership. As it pertains to parent empowerment, if we are to see this movement successfully spread widely, we must support leaders of color at the head of organizations doing this work, and further — local leaders who too often lack access to the existing network and financial capital in education reform. We worry that sometimes education reformers have hesitated to engage parents because of a judgment that rests below the surface of our thoughts. Sometimes reformers craft education solutions assuming that parents do not in fact have the power to be part of those solutions. And while we do have power to drive change, the present pace of change also shows us that we don’t have sufficient power to do it alone. Partnering with empowered parents amplifies the potential for systems change. But it requires us to see parents as equal partners. Alex Cortez is a managing partner at New Profit and leads the organization’s Reimagine School Systems Fund. Yordanos Eyoel is an associate partner at New Profit and co-leads the the organization’s Reimagine School Systems Fund. Alex Cortez is a managing partner at New Profit and leads the organization’s Reimagine School Systems Fund. Yordanos Eyoel is an associate partner at New Profit and co-leads the the organization’s Reimagine School Systems Fund.